TYR End of Season Warehouse Sale 27-30 August 2011!! Hi everyone, this is a different post compared to previous articles. 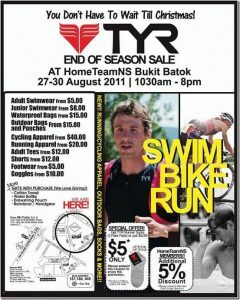 This is to actually inform you of the TYR End of Season Sale at HomeTeamNS Bukit Batok from 27th to 30th August 2011, 1030am to 8pm! Yes, Happy Fish loves sharing the love with their loyal customers. If you’re looking for swimwear or accessories, be sure to check it out. I’ve been to the sales as well and there are so much on sales starting from merely S$5! Items include adult/junior swimwear, t-shirts, dri-fit polo t-shirts, outdoor bags and pouches and goggles. They even have various items for cyclists and runners. Accessories such as water bottles and pull buoys are on sale too! They are also giving away free items if you make a minimum purchase of S$100 and above, if I’m not wrong. Furthermore, if you are a HomeTeamNS member, just flash your member card to receive an additional 10% off (something which I forgot to do as I was too excited -.-). Interesting piece of news…too bad it’s over..would had considered buying..looking forward to the next sales.